Ultra Cuffs are the first forged aluminum rigid frame restraint. 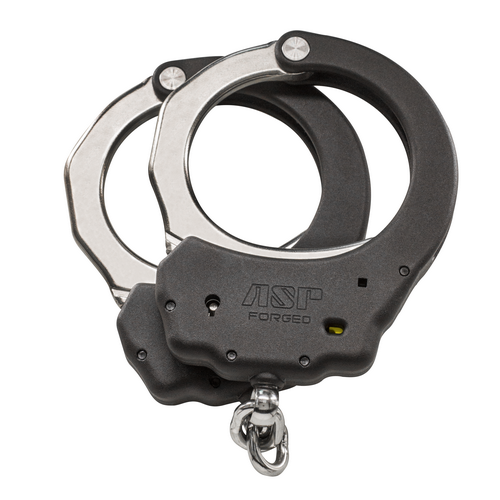 They incorporate the innovative advances in handcuff design that were pioneered by ASP. Ultra Cuffs are the first forged aluminum rigid frame restraint. They incorporate the innovative advances in handcuff design that were pioneered by ASP. Lightweight, round smooth edges, interchangeable Lock Sets, conical bows, double sided keyways. Added to these revolutionary design elements is a frame that is forged from 7075 T6 ordnance grade aluminum and permanently joined by 4140 heat treated spiral locking pins. The result is a series of handcuffs that have been called the most significant advance in restraint technology of this century. This is a Chain Handcuff that was designed in the field. Input came from officers and instructors in over 100 nations where ASP currently conducts training. As a result, this ASP design incorporates the practical features most requested by officers on the street. A flat contact bow improves application. Bows are highly radiused to prevent injury. There is a keyway and double lock slot on each side of each restraint. A double lock warning bar is readily visible. Both double and single locks are released by turning the key in a single direction. The lock assemblies are unitized and replaceable. The frame geometry, deep set teeth and precision smooth action eliminates the need for back loading. Ultra Cuffs employ innovative technologies that are available only from ASP. These are full featured restraints that were specifically designed to “Lighten the Load” of the officer or agent. They provide exclusive features that increase both performance and safety.